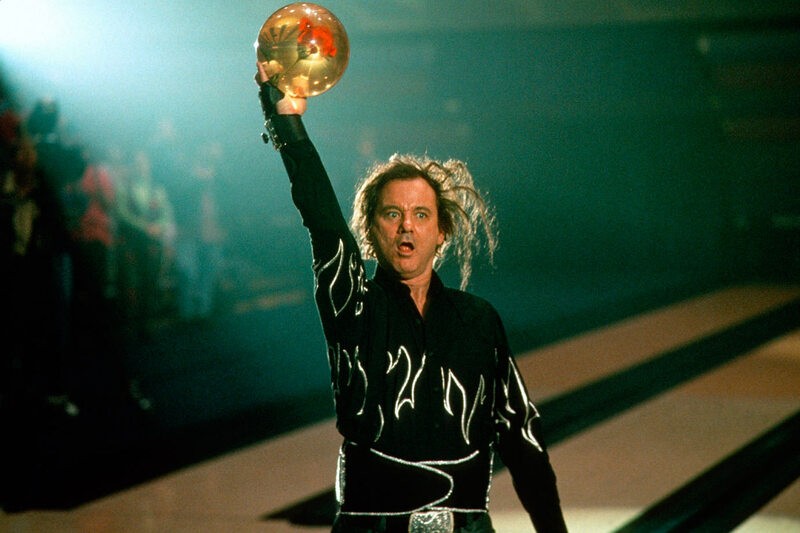 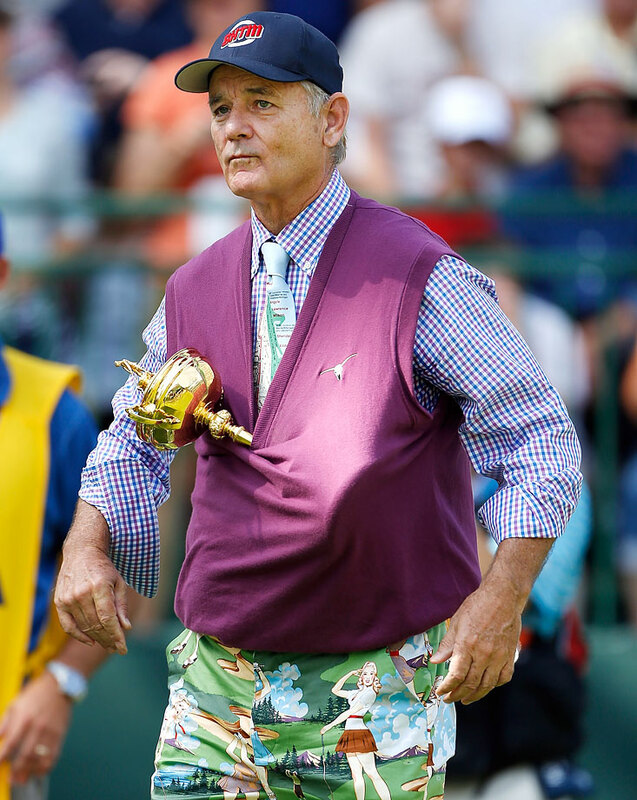 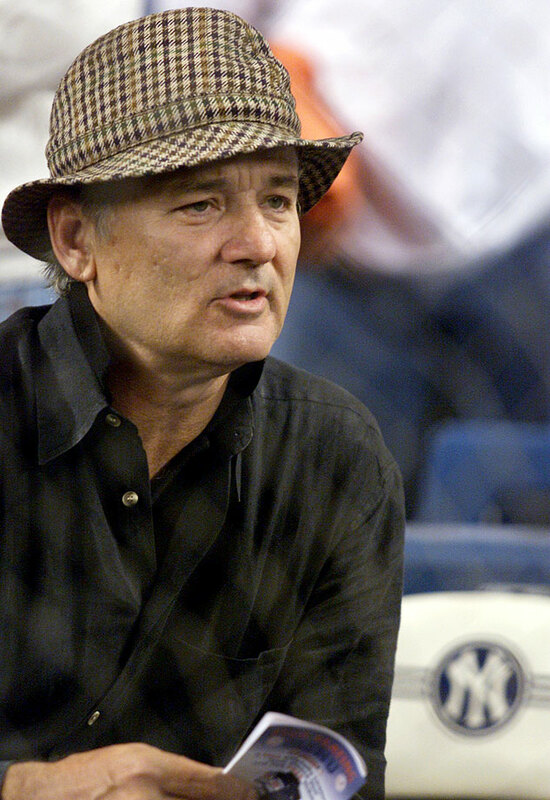 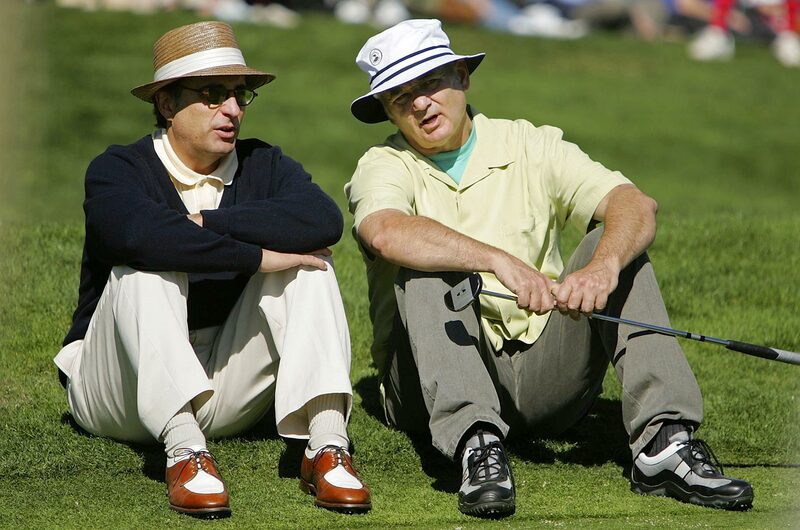 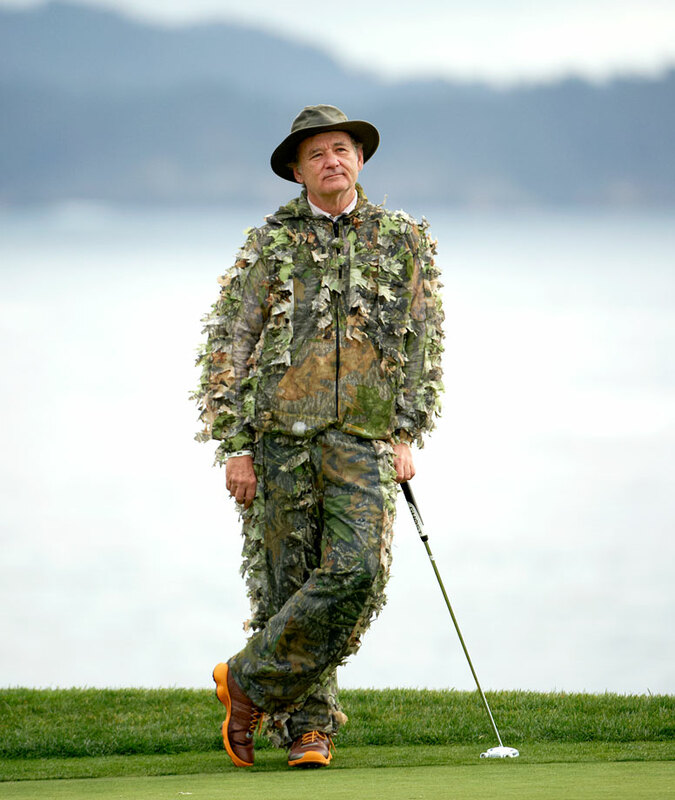 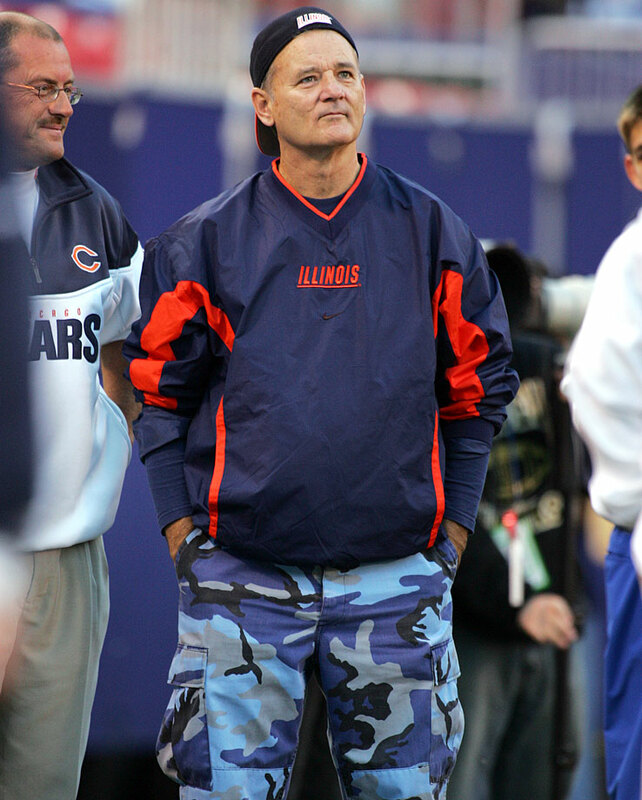 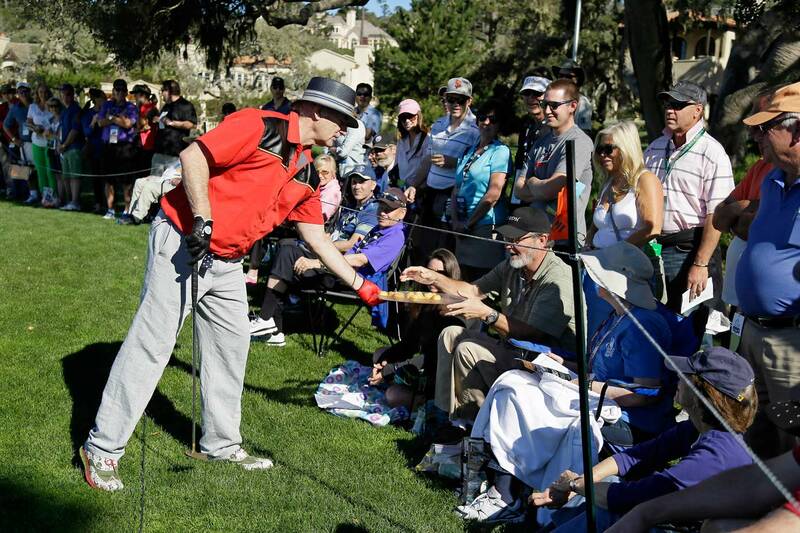 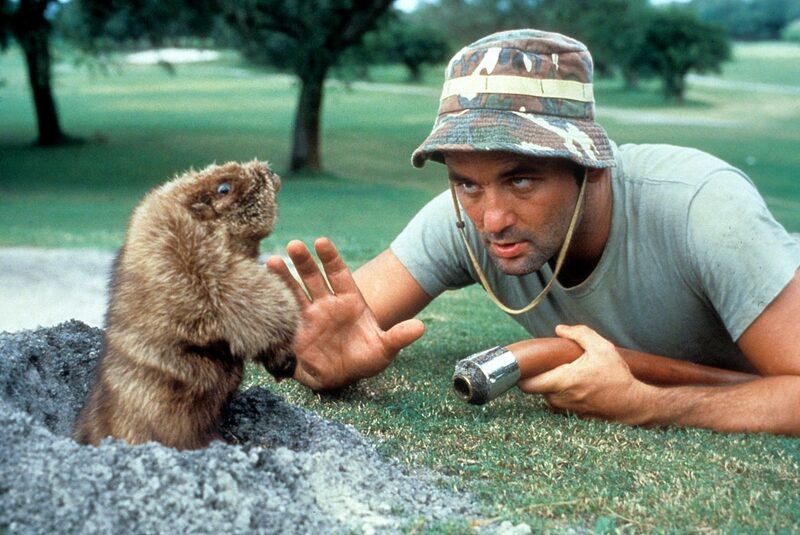 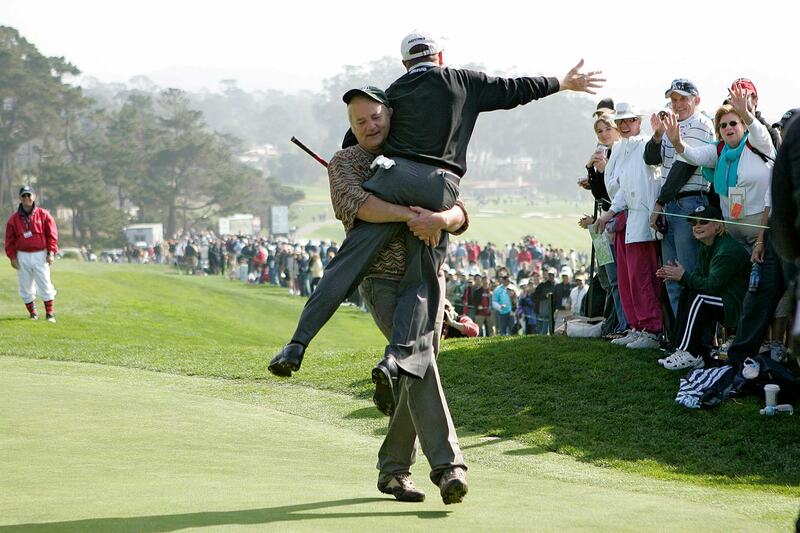 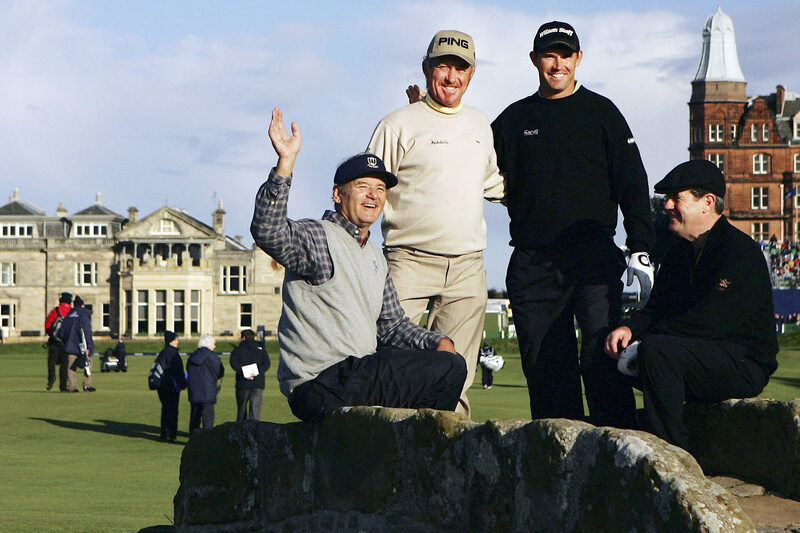 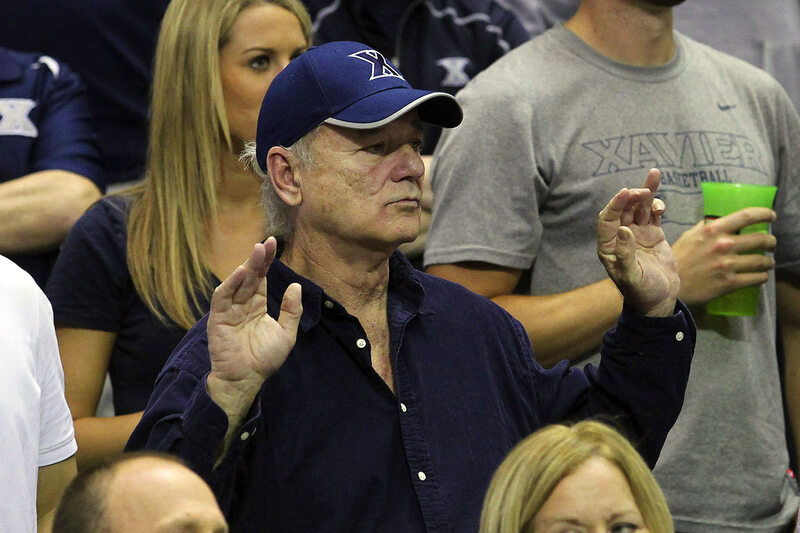 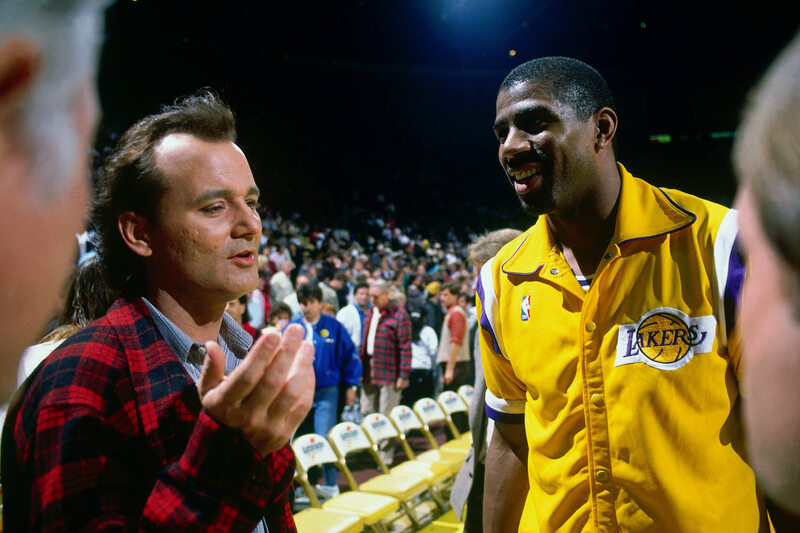 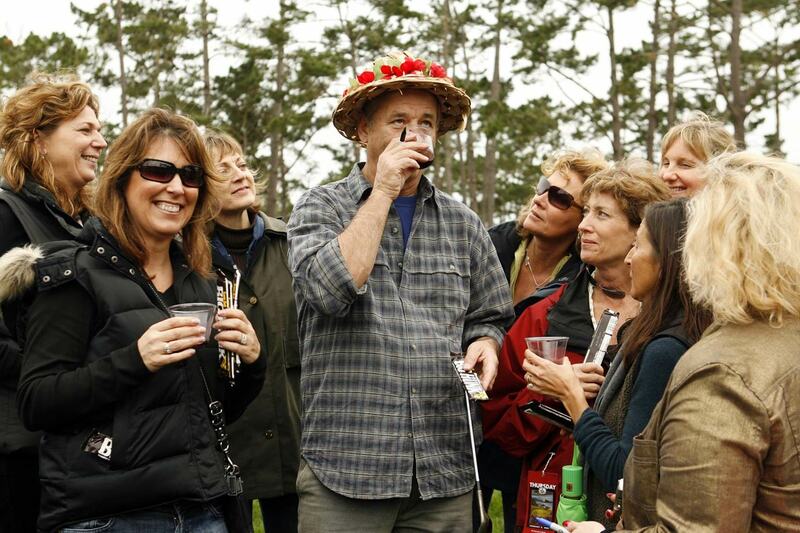 Here's a look at Bill Murray, an avid golfer and sports fan, through the years. 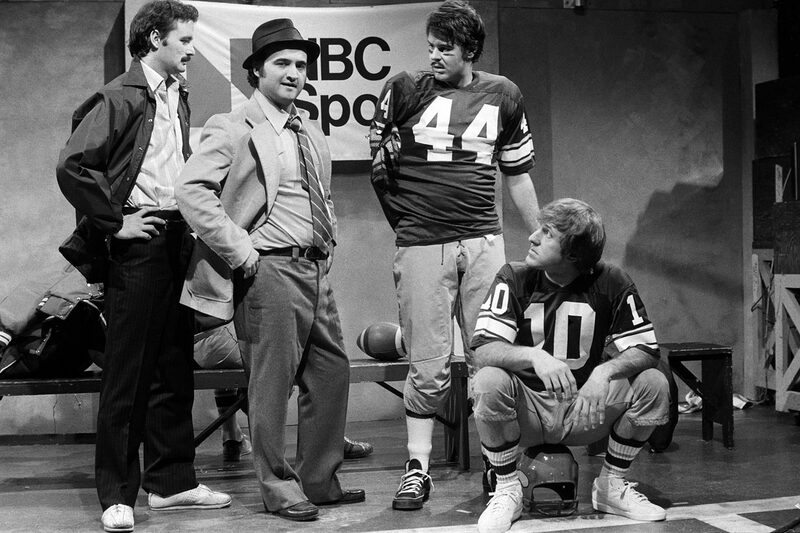 Bill Murray, John Belushi and Dan Aykroyd act alongside Minnesota Vikings quarterback Fran Tarkenton during SNL's "Team Saturday Night" skit on Jan. 29, 1977 in New York City. 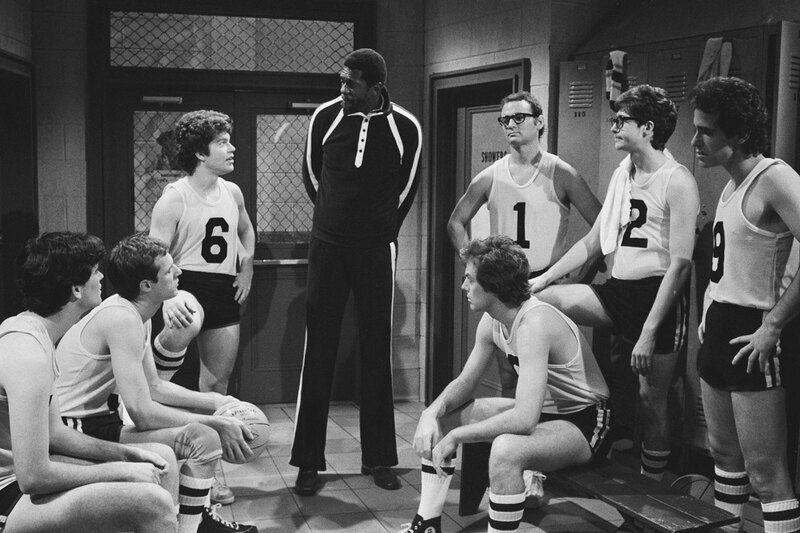 Bill Murray appears with Al Franken and Bill Russell during SNL's "The Black Shadow" skit on Nov. 3, 1979 in New York City. 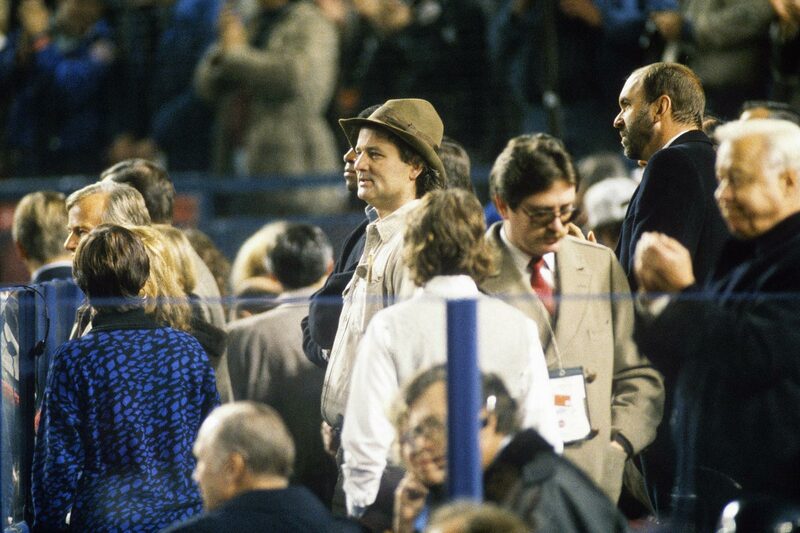 Bill Murray takes in the festivities during the 1986 World Series at Shea Stadium in Flushing, N.Y.
Bill Murray talks with Magic Johnson before a Los Angeles Lakers game in 1988 at the Great Western Forum in Inglewood, Calif.
Bill Murray watches the MLB All-Star Game on July 10, 1990 at Wrigley Field in Chicago. 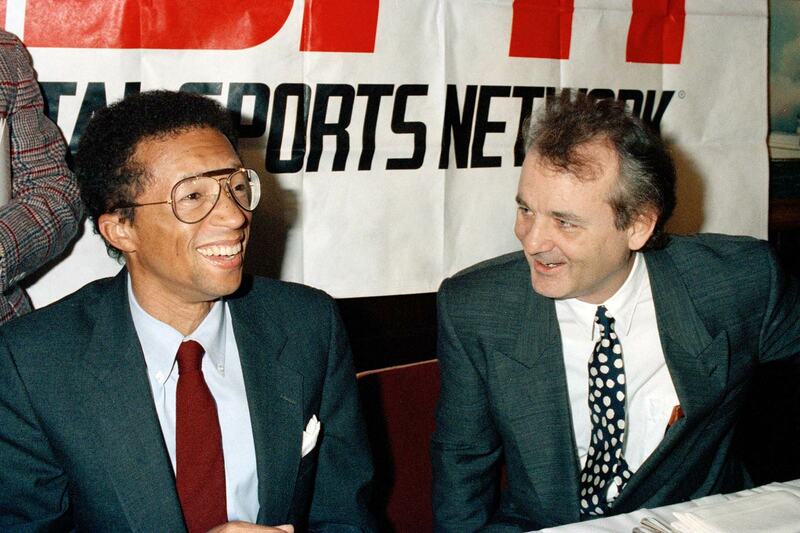 Arthur Ashe and Bill Murray share a laugh prior to a news conference announcing the formation of the ESPY Awards, with some of the proceeds going to the Arthur Ashe Foundation, on Dec. 15, 1992 in New York City. 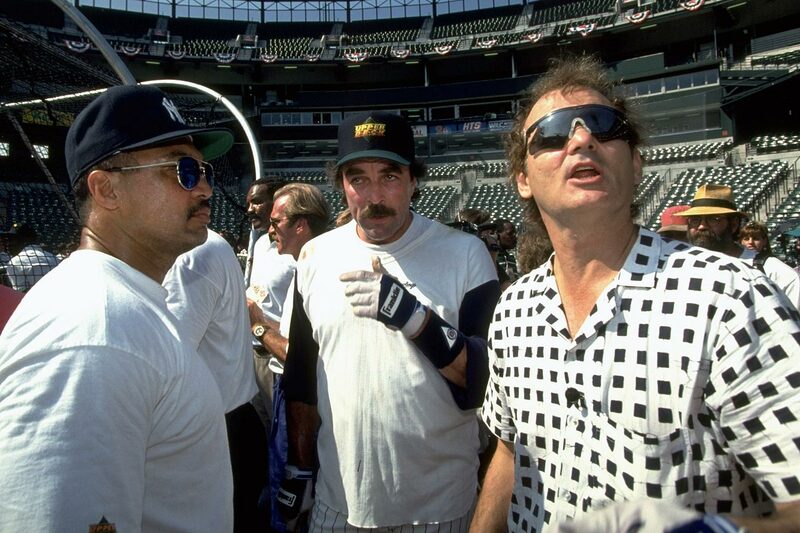 Reggie Jackson, Tom Selleck and Bill Murray look on during the Old Timers Game on July 13, 1993 at Oriole Park at Camden Yards in Baltimore. 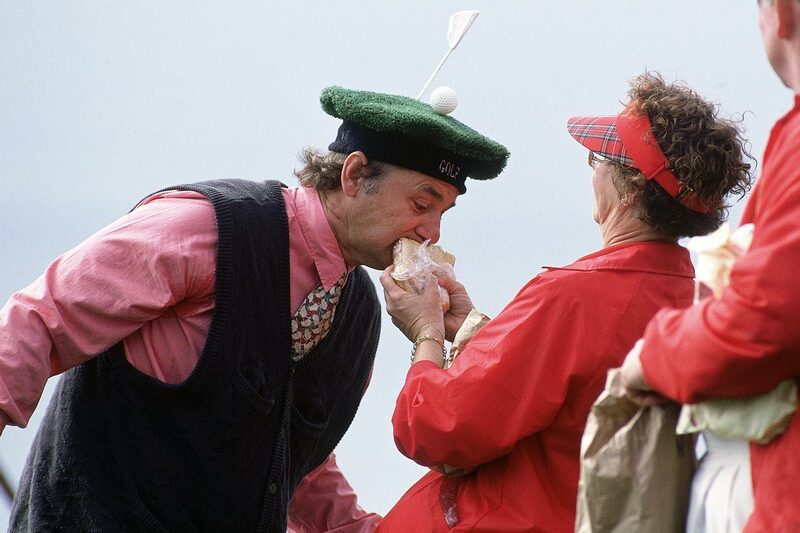 Bill Murray pops up his golf ball with a baseball bat on the 18th green of the AT&T Pebble Beach National Pro-Am golf tournament on Feb. 5, 1994 at Pebble Beach, Calif.
Bill Murray takes a bite from a fan's sandwich during the AT&T Pebble Beach National Pro-Am golf tournament on Feb. 4, 1995 at Pebble Beach, Calif.
Bill Murray flashes a Chicago Cubs undershirt alongside Atlanta Braves owner Ted Turner during Game 6 of the World Series between the Braves and the Cleveland Indians on Oct. 28, 1995 at Atlanta-Fulton County Stadium in Atlanta. 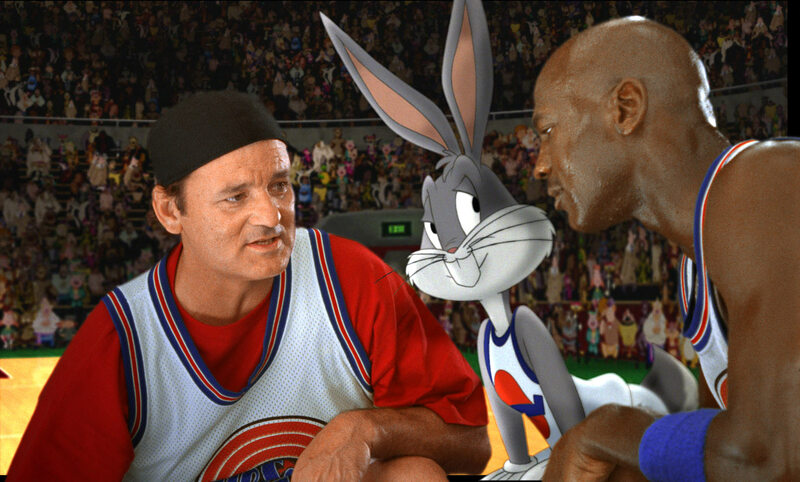 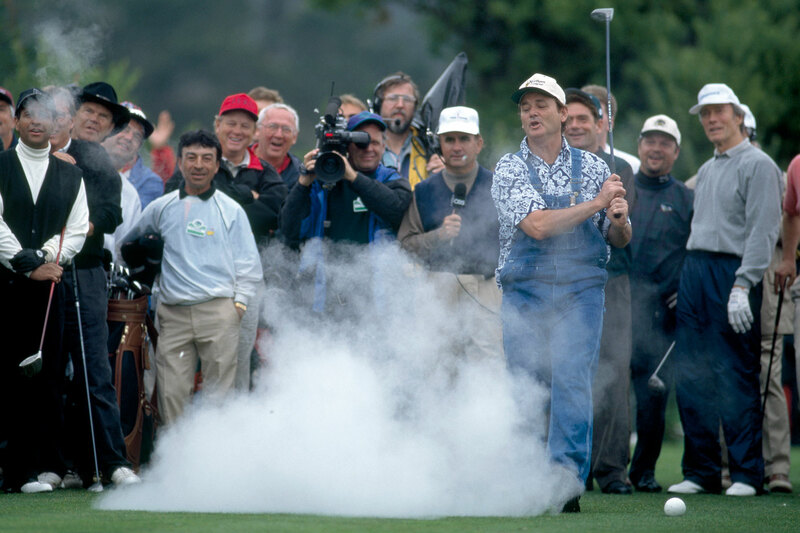 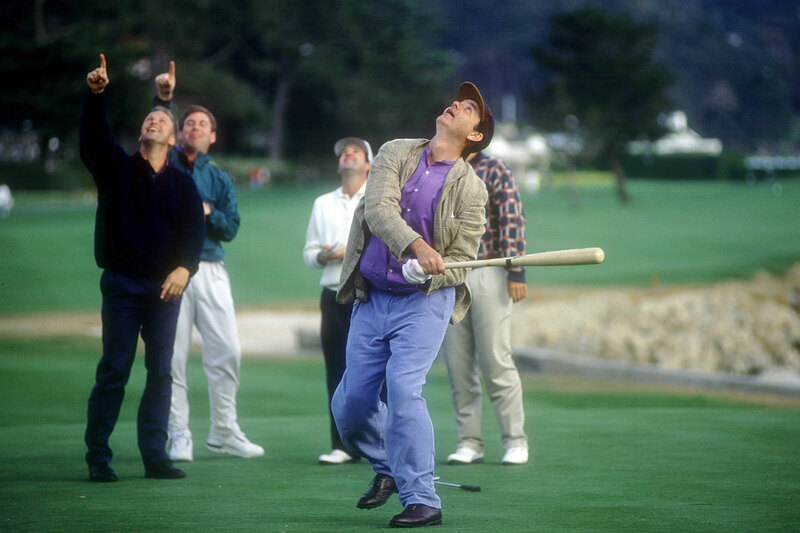 Bill Murray hits a fake golf ball which explodes in a cloud of smoke during during the 1996 AT&T Pebble Beach National Pro-Am golf tournament at Pebble Beach, Calif.
Bill Murray appears in the 1996 film 'Space Jam' alongside Bugs Bunny and Michael Jordan. 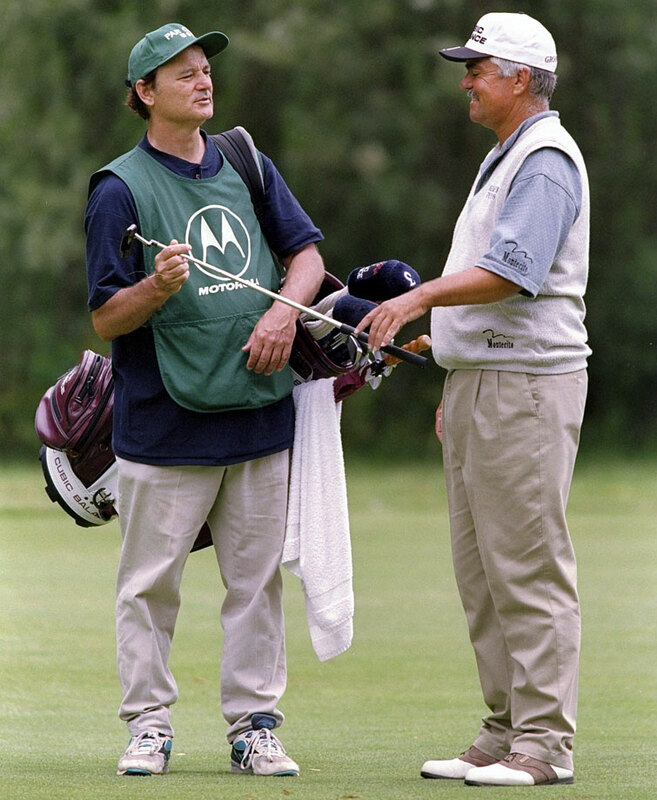 Scott Simpson takes a club from caddie Bill Murray during the Motorola Western Open at the Cog Hill Country Club in Lemont, Ill.
Bill Murray watches Game 4 of the ALCS between the New York Yankees and the Seattle Mariners on Oct. 21, 2001 at Yankee Stadium in the Bronx, N.Y.
Bill Murray hugs Laura Davies to the ground during the AT&T Pebble Beach National Pro-Am golf tournament on Feb. 7, 2003 at Pebble Beach, Calif.
Bill Murray appears on NBA TV with Ahmad Rashad before Game 4 of the NBA Finals between the New Jersey Nets and the San Antonio Spurs on June 11, 2003 at Continental Airlines Arena in East Rutherford, N.J.
Bill Murray gestures to the crowd before throwing out the ceremonial first pitch for the Chicago Cubs home opener against the Pittsburgh Pirates on April 12, 2004 at Wrigley Field in Chicago. 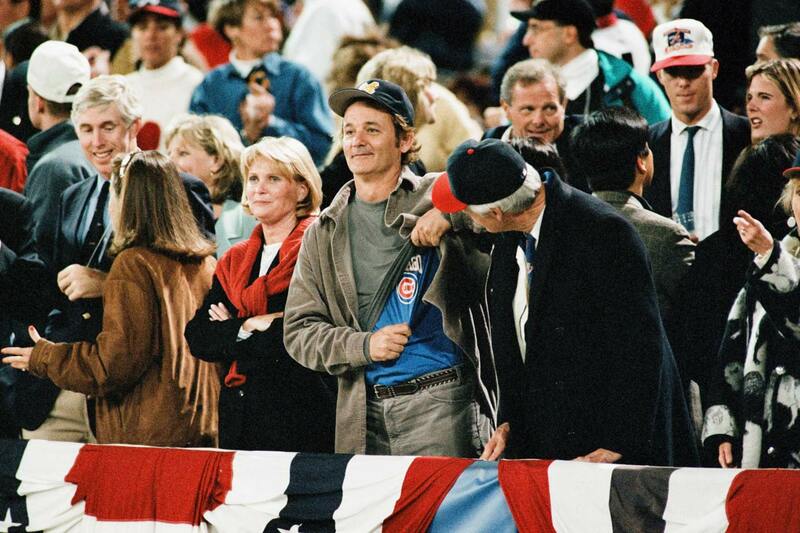 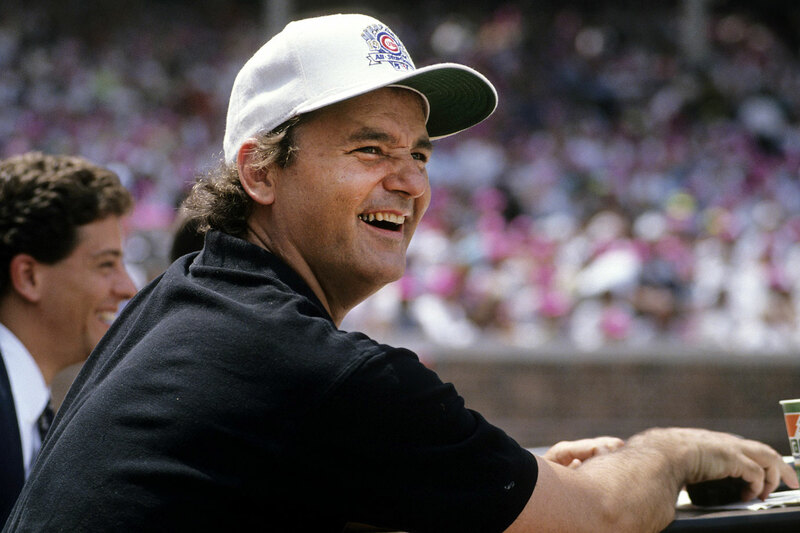 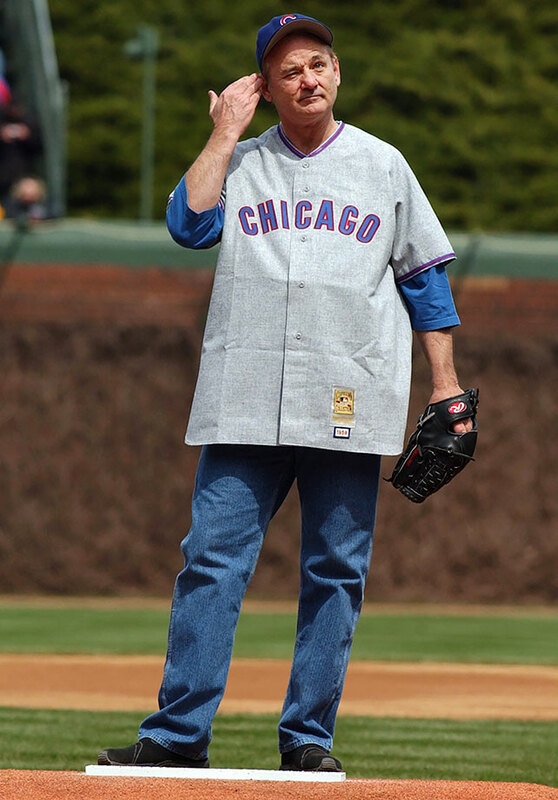 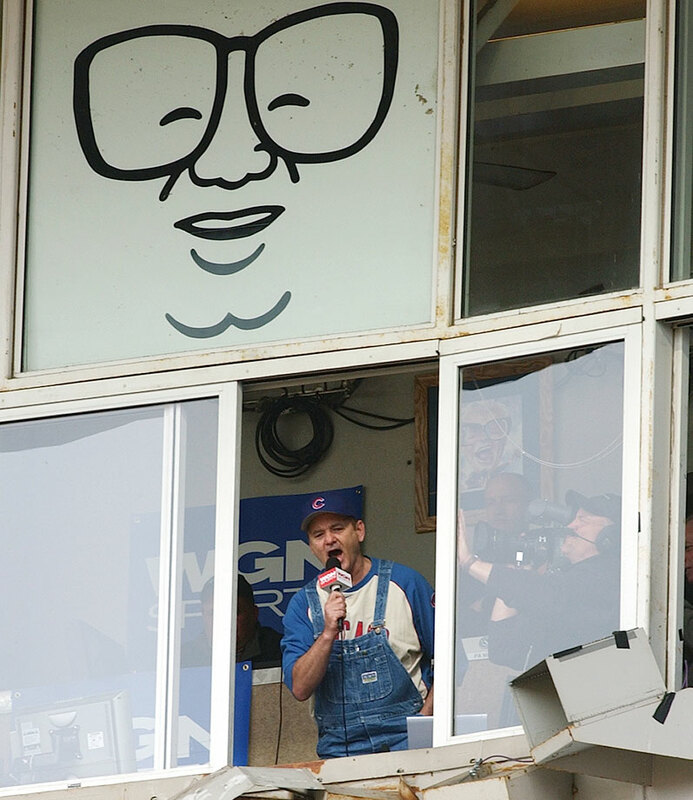 Bill Murray sings "Take Me Out the Ball Game" to the crowd during the 7th inning stretch of the Chicago Cubs home opener against the Pittsburgh Pirates on April 12, 2004 at Wrigley Field in Chicago. 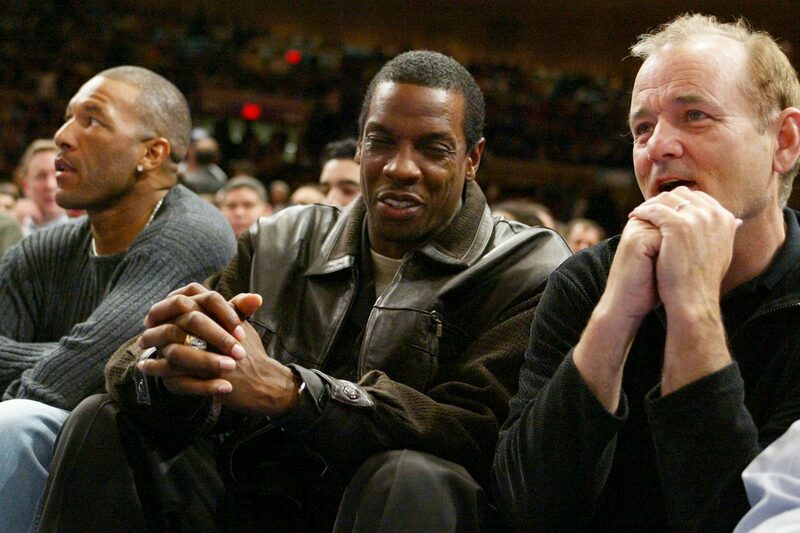 Gary Sheffield, Dwight Gooden and Bill Murray sit courtside for the the New York Knicks game against the Cleveland Cavaliers on April 14, 2004 at Madison Square Garden in New York City. 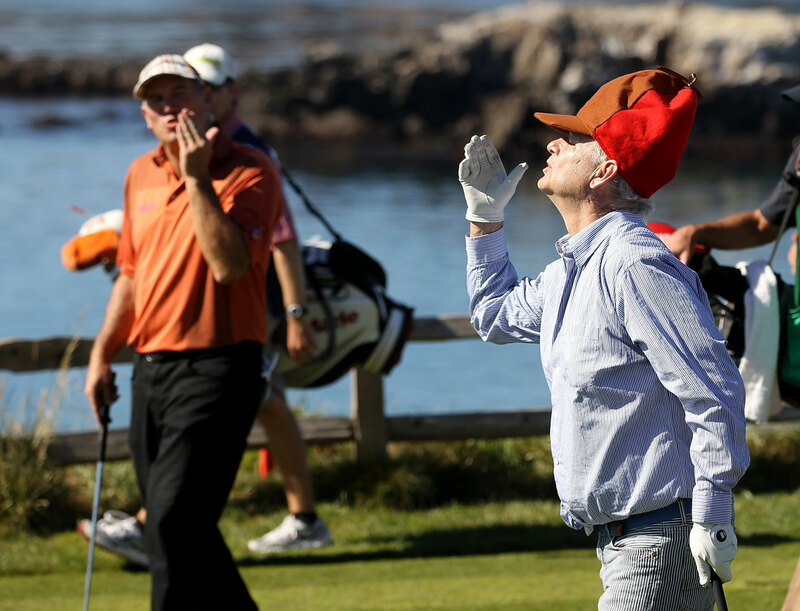 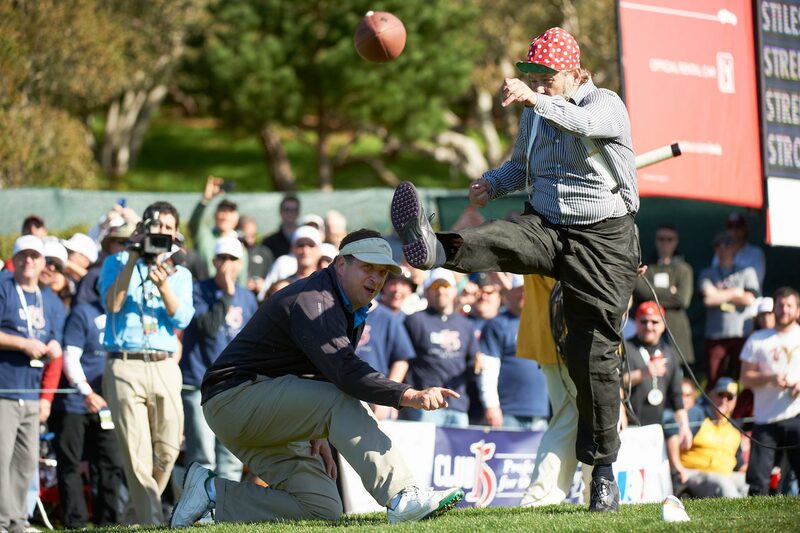 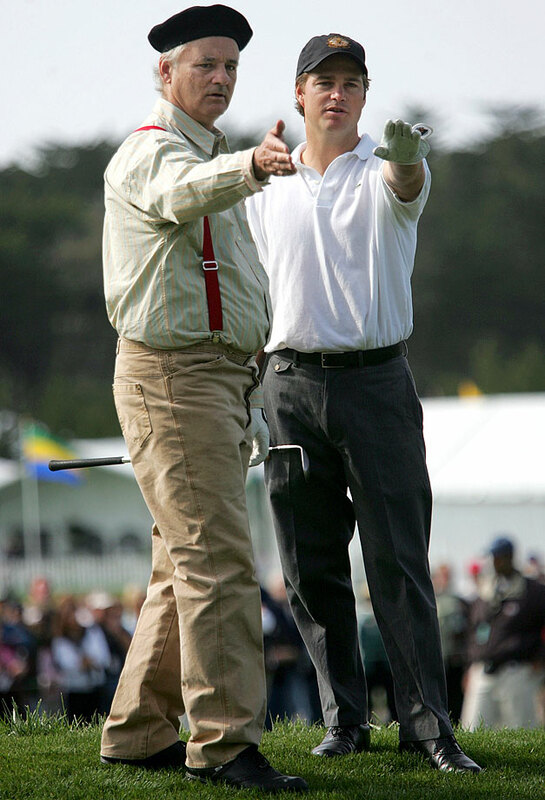 Bill Murray attends the Chicago Bears game against the New York Giants on Nov. 7, 2004 at Giants Stadium in East Rutherford, N.J.
Bill Murray and Chris O'Donnell line up a shot during the 3M Celebrity Golf Challenge on Feb. 9, 2005 in Pebble Beach, Calif. 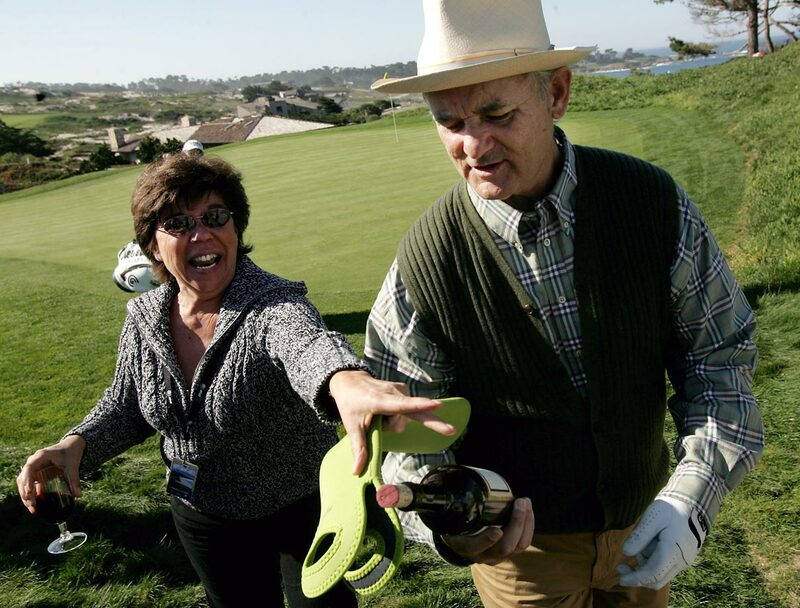 Fan Norma Glaser tries to retrieve her bottle of wine from Bill Murray during the AT&T Pebble Beach National Pro-Am golf tournament on Feb. 10, 2005 in Pebble Beach, Calif.
Bill Murray reacts during the Illinois Fighting Illini's 75-70 loss to the North Carolina Tar Heels in the NCAA Men's National Championship Game on April 4, 2005 at the Edward Jones Dome in St. Louis. 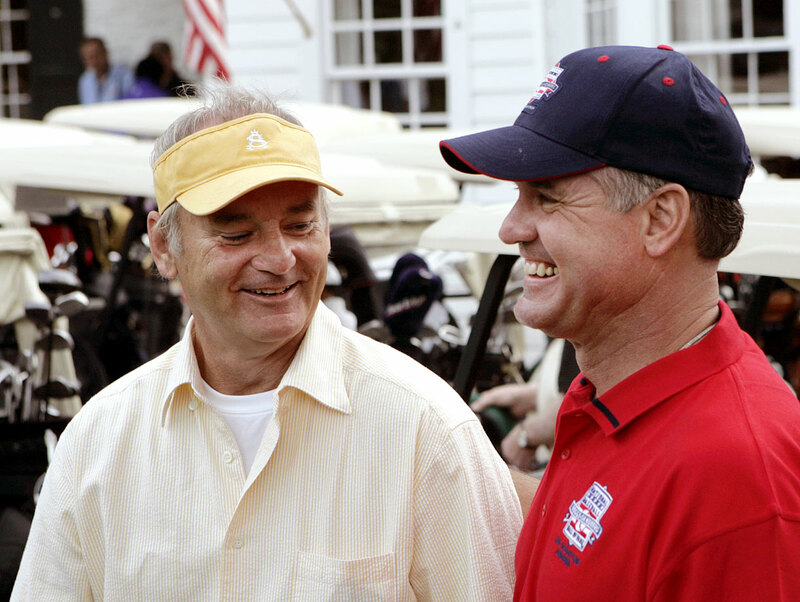 Bill Murray shares a laugh with future Baseball Hall of Fame inductee Ryne Sandberg before playing golf on July 30, 2005 in Cooperstown, N.Y.
Bill Murray talks with Andy Garcia during the 3M Celebrity Golf Challenge on Feb. 8, 2006 in Pebble Beach, Calif.
Bill Murray carries Jeff Sluman to the next tee during the AT&T Pebble Beach National Pro-Am golf tournament on Feb. 11, 2006 in Pebble Beach, Calif.
Bill Murray poses with Miguel Angel Jimenez, Padraig Harrington and JP McManus on the Swilkin Burn bridge during The Alfred Dunhill Links Championship at The Old Course on Oct. 6, 2006 in St. Andrews, Scotland. 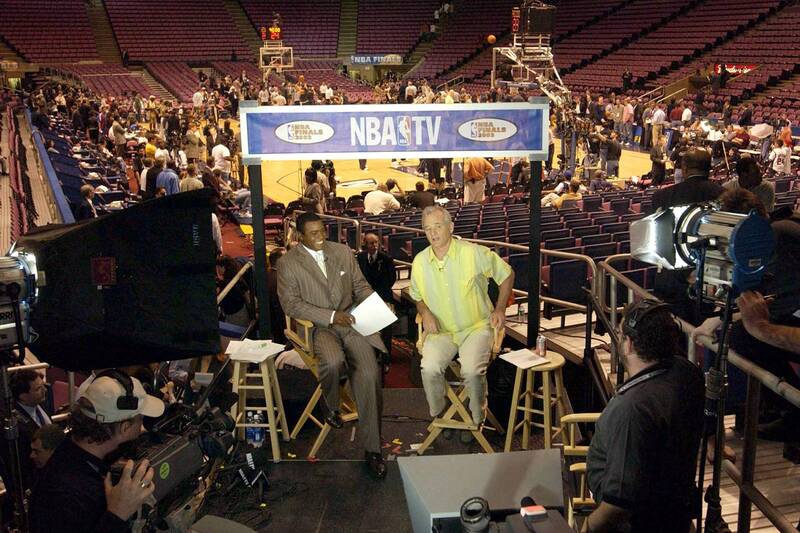 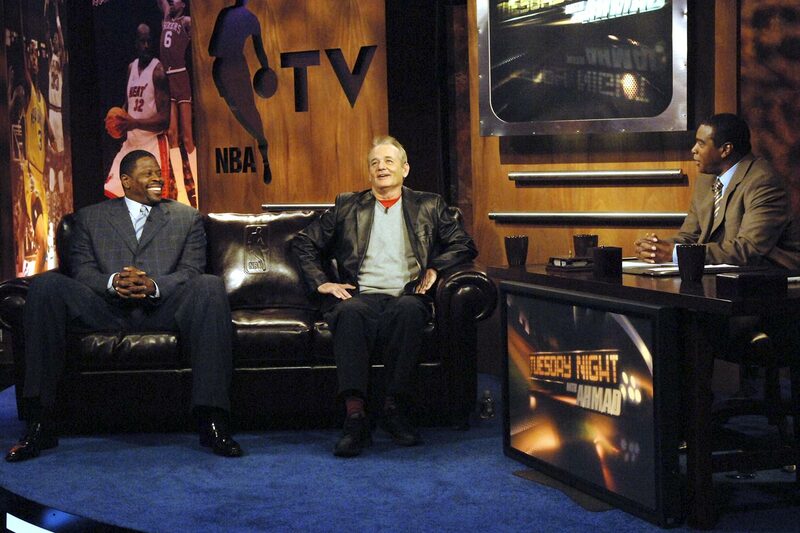 Patrick Ewing and Bill Murray join Ahmad Rashad on the set of NBA TV's "Tuesday Night with Ahmad" on Jan. 2, 2007 in Secaucus, N.J.
Bill Murray drinks wine with fans during the AT&T Pebble Beach National Pro-Am golf tournament on Feb. 8, 2007 in Pebble Beach, Calif.
Bill Murray carries a fan on his back during the AT&T Pebble Beach National Pro-Am golf tournament on Feb. 10, 2007 in Pebble Beach, Calif.
Chicago Cubs second baseman Mark DeRosa shares a laugh with Bill Murray during batting practice before the Cubs game against the Florida Marlins on Sept. 27. 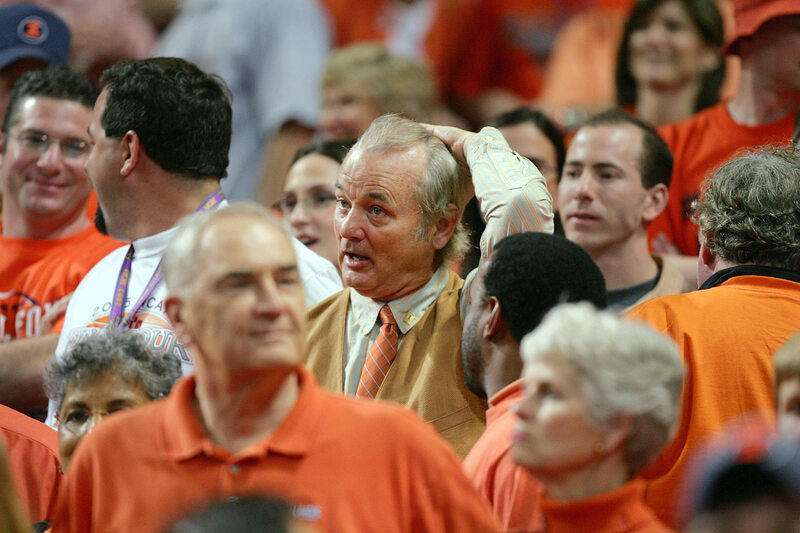 2007 at Dolphin Stadium in Miami. 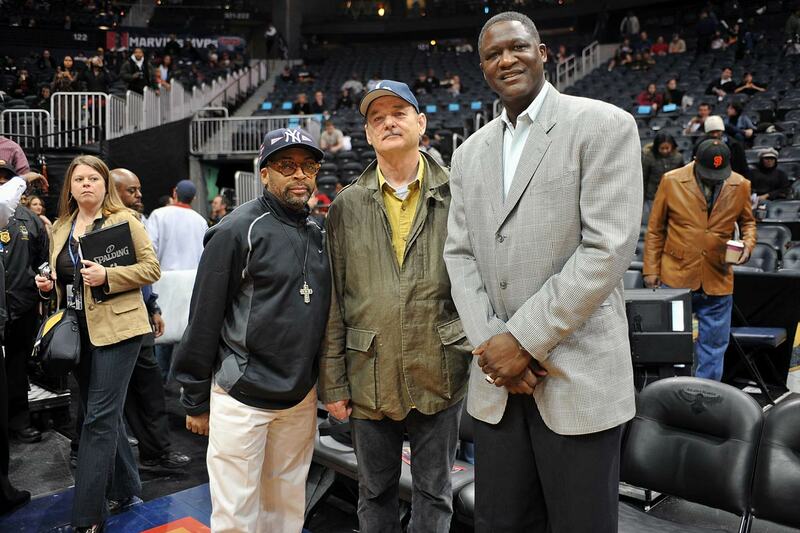 Spike Lee, Bill Murray and Dominique Wilkins pose together during the Atlanta Hawks game against the Cleveland Cavaliers on March 1, 2009 at Philips Arena in Atlanta. 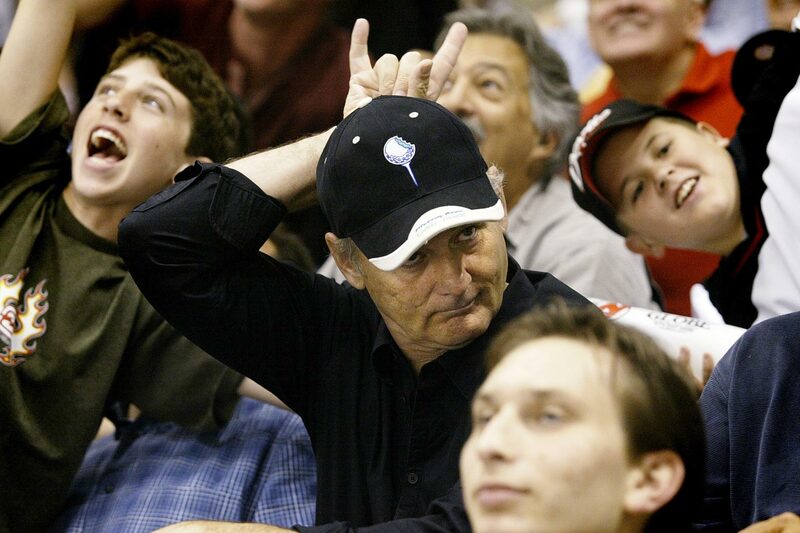 Bill Murray is on his feet as he urges on the Chicago Cubs during their game against the San Diego Padres on Aug. 19, 2009 at Petco Park in San Diego. 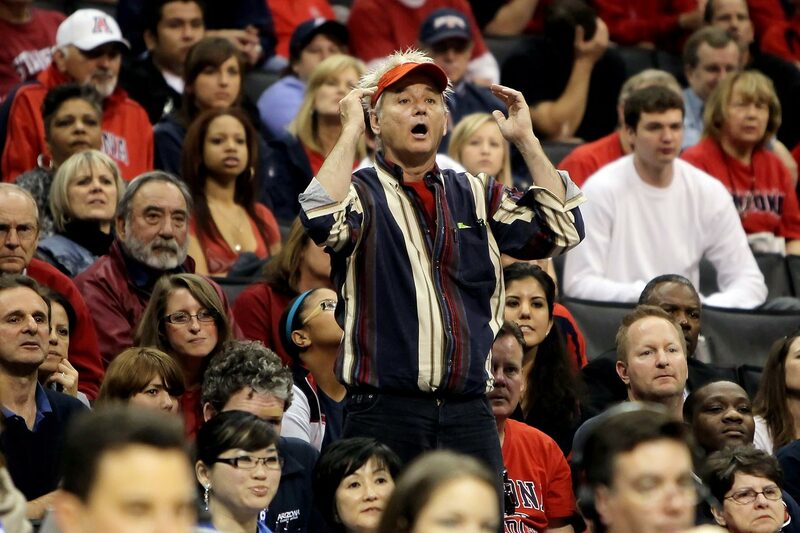 Bill Murray reacts during the Pac-10 Basketball Tournament quarterfinals between the Arizona Wildcats and the UCLA Bruins on March 11, 2010 at Staples Center in Los Angeles. 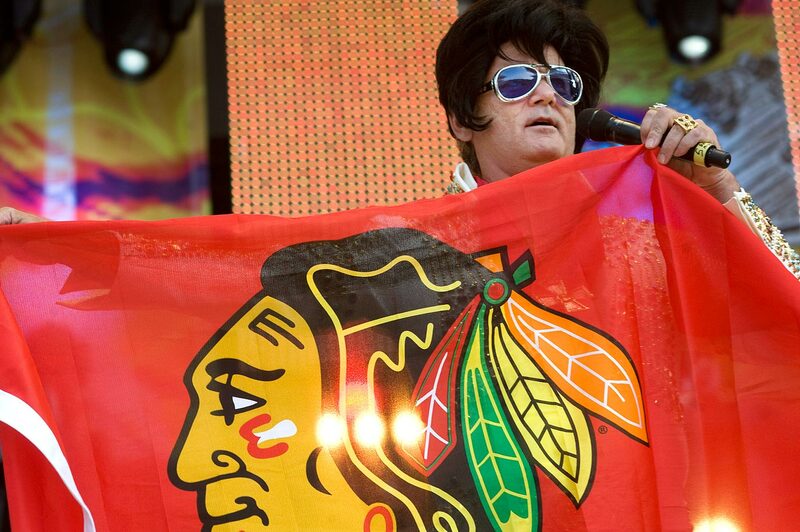 Bill Murray, dressed as Elvis Presley, holds a Chicago Blackhawks banner as he performs onstage at Eric Clapton's Crossroads Guitar Festival on June 26, 2010 at Toyota Park in Bridgeview, Ill.
Bill Murray blows kisses to his playing partner, D.A. 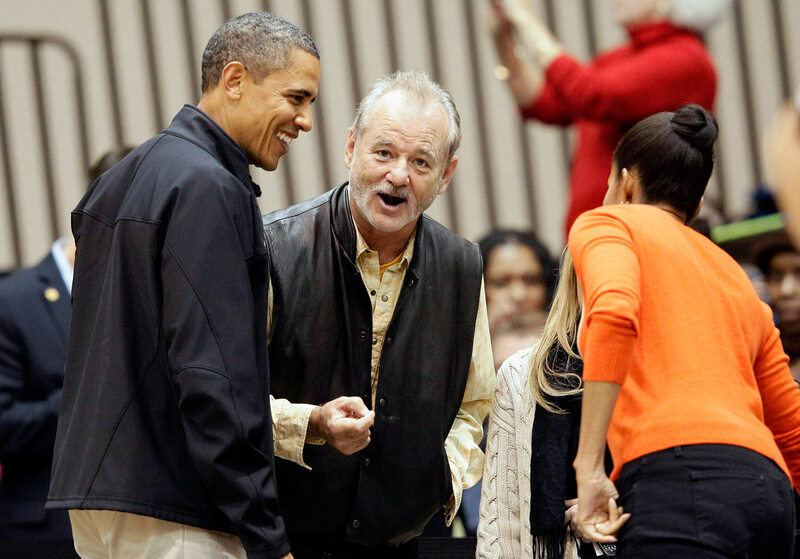 Points, after they teed off on the 7th hole during the AT&T Pebble Beach National Pro-Am golf tournament on Feb. 12, 2011 in Pebble Beach, Calif.
Bill Murray shares a laugh with President Barack Obama and First Lady Michelle Obama before an NCAA basketball game between Oregon State and Towson on Nov. 26, 2011 in Towson, Md. 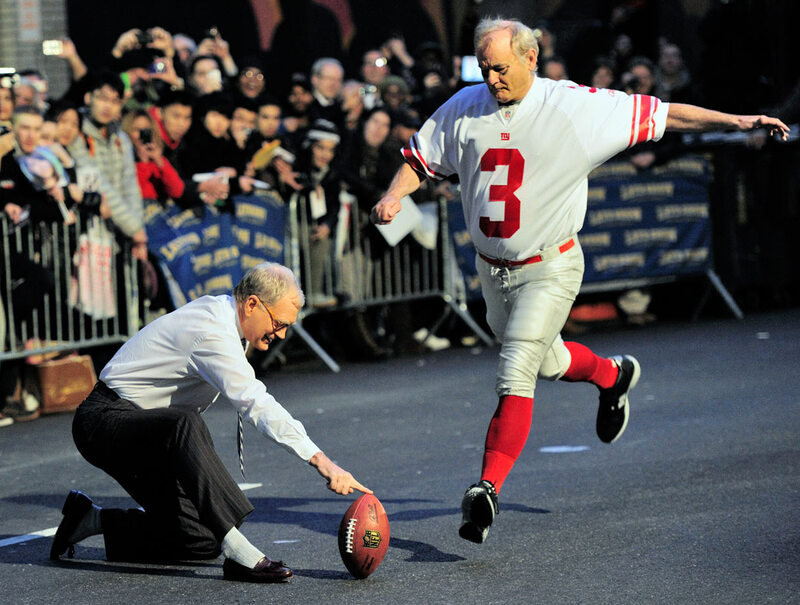 Bill Murray attempts a field goal with "Late Show" host David Letterman doing the holding on Jan. 31, 2012 on New York's 53rd Street. 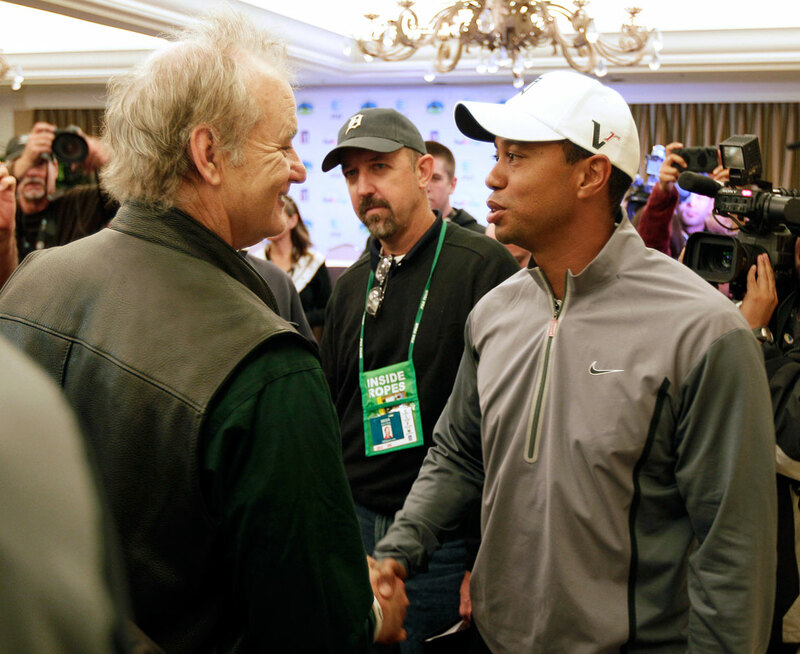 Tiger Woods greets Bill Murray after a news conference at the AT&T Pebble Beach National Pro-Am golf tournament on Feb. 7, 2012 in Pebble Beach, Calif.
Bill Murray sports a camouflage outfit during the AT&T Pebble Beach National Pro-Am golf tournament on Feb. 11, 2012 in Pebble Beach, Calif.
Bill Murray runs the bases before throwing out the ceremonial first pitch for the Chicago Cubs game against the Washington Nationals during opening day on April 5, 2012 at Wrigley Field in Chicago. 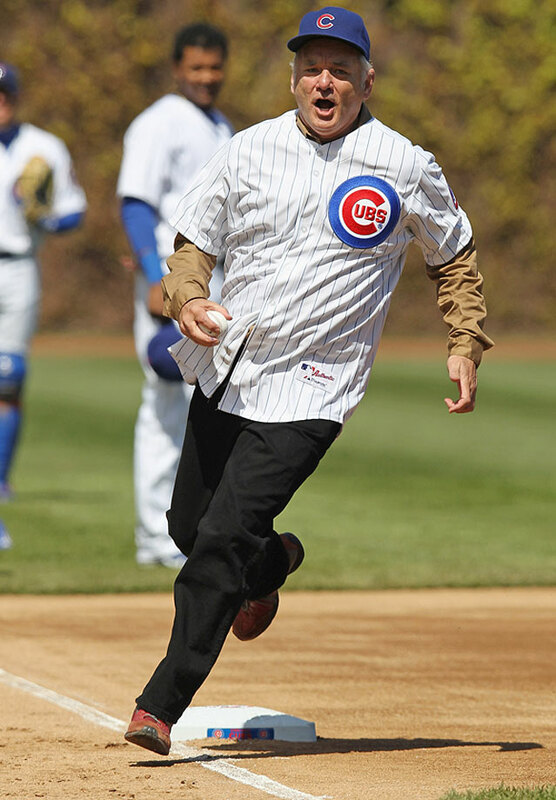 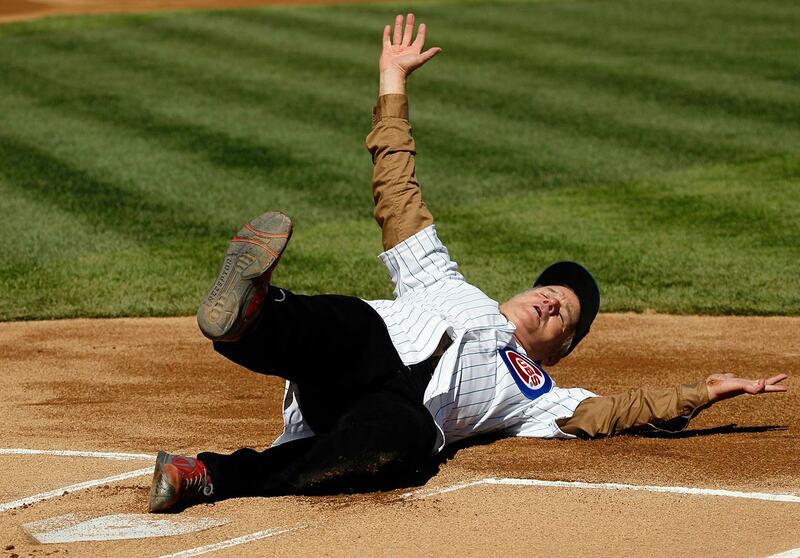 Bill Murray slides into home after rounding the bases before throwing out the ceremonial first pitch for the Chicago Cubs game against the Washington Nationals during opening day on April 5, 2012 at Wrigley Field in Chicago. 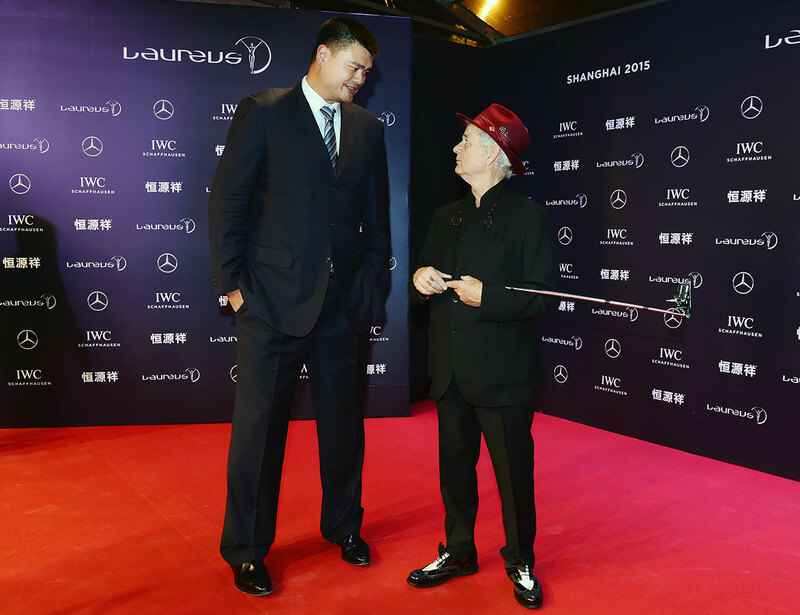 Yao Ming and Bill Murray attend the Laureus World Sports Awards on April 15, 2015 at Shanghai Grand Theatre in Shanghai, China. 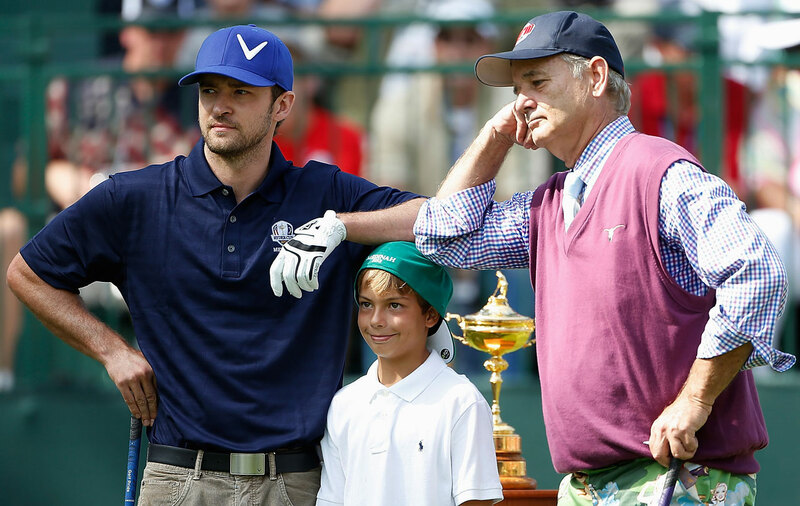 Bill Murray pretends to steal the Ryder Cup on the first tee during the Ryder Cup Captains & Celebrity Scramble on Sept. 25, 2012 at Medinah Country Golf Club in Medinah, Ill.
Justin Timberlake and Bill Murray wait with Sean Lehman on the first tee during the Ryder Cup Captains & Celebrity Scramble on Sept. 25, 2012 at Medinah Country Golf Club in Medinah, Ill.
Bill Murray stands with Dustin Johnson during the first round of the AT&T Pebble Beach National Pro-Am golf tournament on Feb. 7, 2013 in Pebble Beach, Calif.
Bill Murray kicks a football with Harris Barton holding the ball during during the AT&T Pebble Beach National Pro-Am golf tournament on Feb. 9, 2013 in Pebble Beach, Calif.
Bill Murray serves a tray of donut holes to fans around the second green during the third round of the AT&T Pebble Beach National Pro-Am golf tournament on Feb. 14, 2015 in Pebble Beach, Calif.
Yao Ming and Bill Murray attend the 2015 Laureus World Sports Awards on April 15, 2015 at the Shanghai Grand Theatre in Shanghai, China. 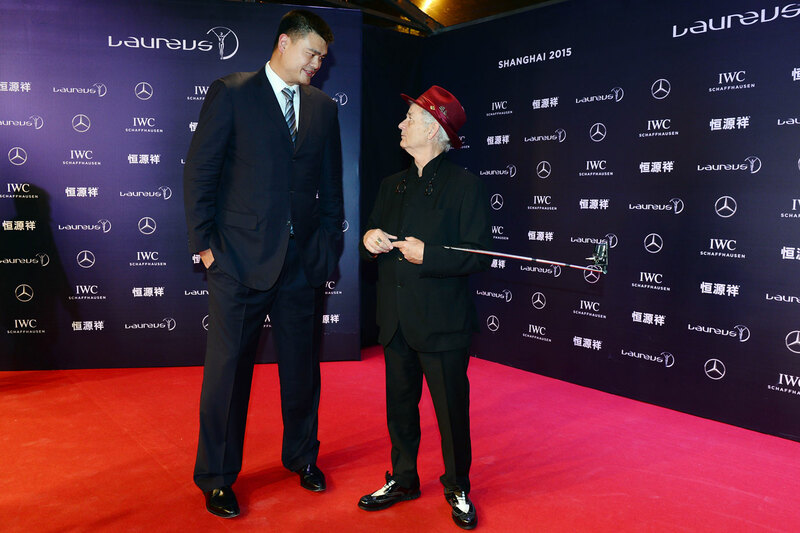 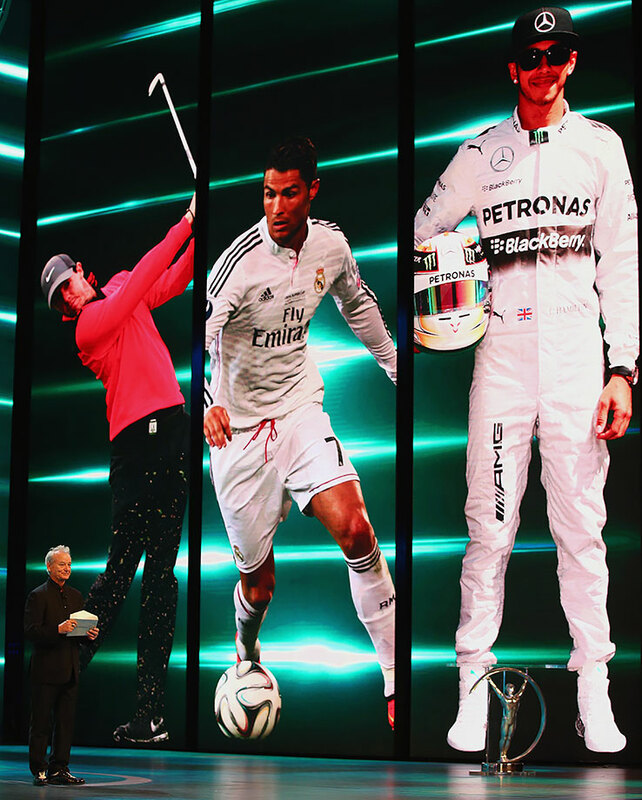 Bill Murray announces the Laureus World Sportsman of the Year award on April 15, 2015 at the Shanghai Grand Theatre in Shanghai, China. 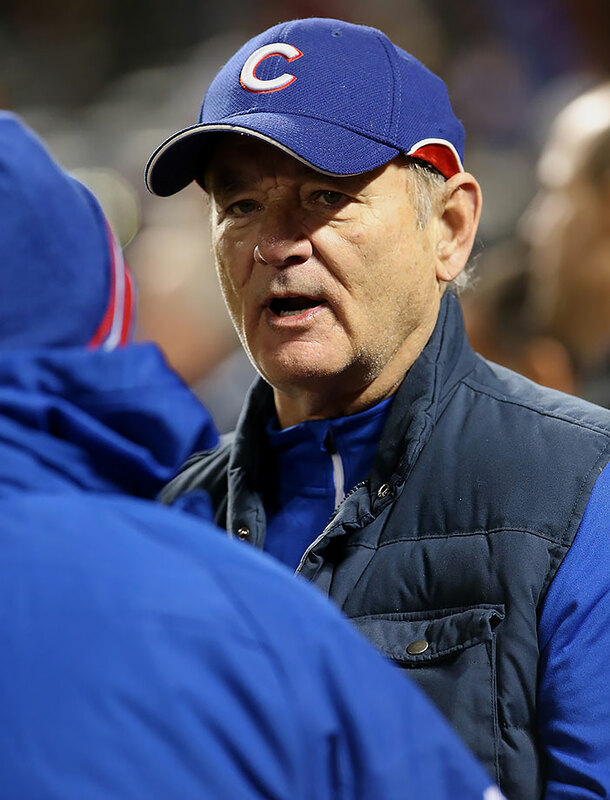 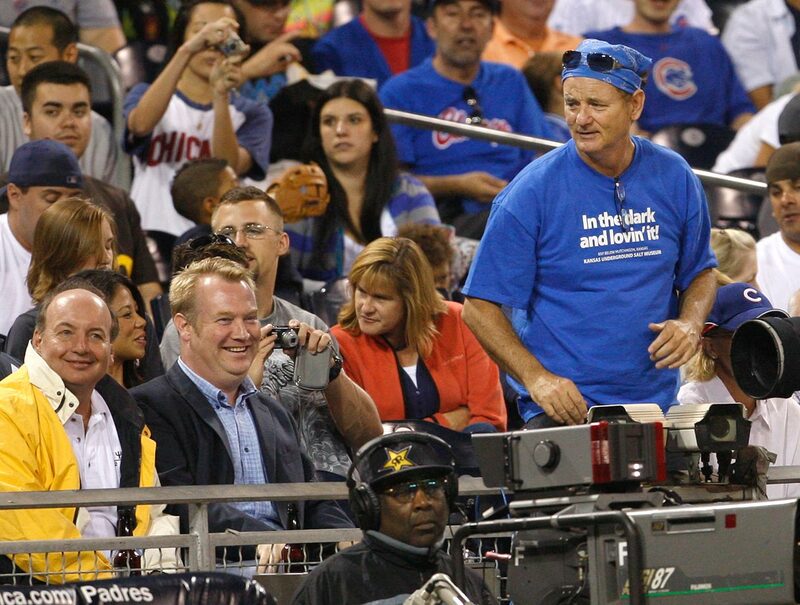 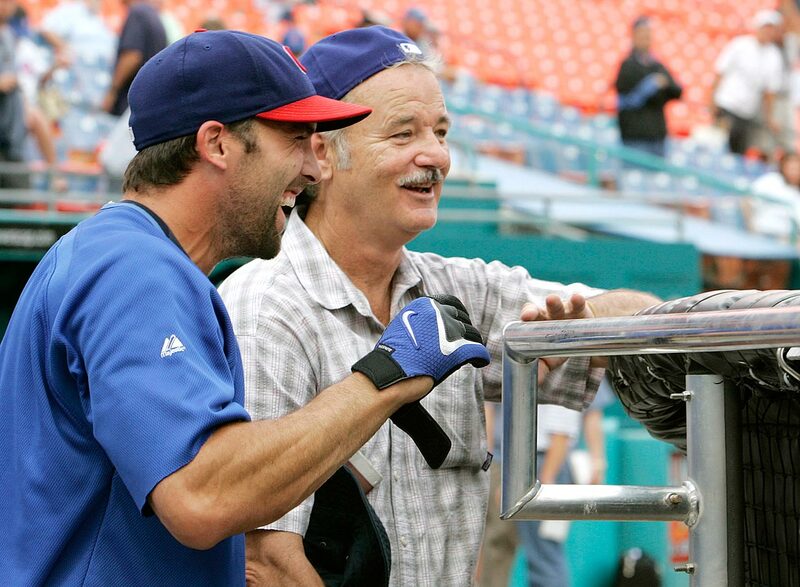 Bill Murray attends Game 2 of the NLCS between the Chicago Cubs and the New York Mets on Oct. 18, 2015 at Citi Field in Flushing, N.Y.
Bill Murray attends the 2015 Advocare Invitational basketball championship game between the Xavier Musketeers and Dayton Flyers on Nov. 29, 2015 at the ESPN Wide World of Sports HP Field House in Orlando, Fla.